This stylish Camo & Pink Sling Dog Carrier is a way for both you and your dog to make a fashion statement! 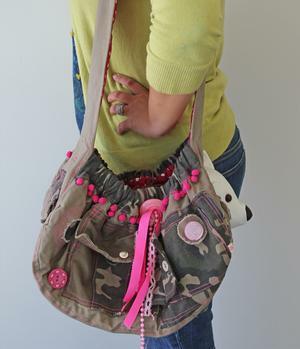 The fun camouflage and tan outside is accented with pom pom trim, pink stitching, wild buttons, beads and ribbons. The inside is a quilted bright pink polka dot pattern. Removable inner pad. Plastic "plate" in bottom provides a stable surface for your dog. Also has an adjustable strap and quick-snap clasp to tighten up top opening. No zippers! Heads will be turning when you have this carrier on your shoulder! • Secure attached leash to collar clasp inside for dog's safety. • Four outer pockets and end opening for dog's head (can be buttoned up too).